Are you a Thrill Seeker? Do you Crave Outdoor Adventure? It's Time To Experience Nearly 3,200 Feet of Zip Line Adrenaline! 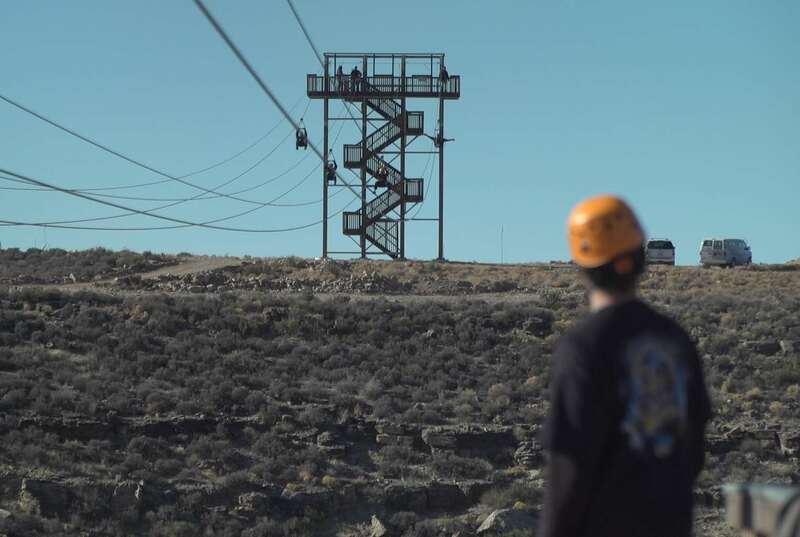 Located at Hualapai Ranch about a mile from the world-famous Grand Canyon Skywalk, the Zip Line at Grand Canyon West will let you soar 500 feet above the floor of a spectacular side canyon! You'll approach speeds of up to 40 mph as blue skies and epic scenery rush past. With 3,200 feet of zip line over two separate runs, you and your group can fly with us today! High Winds and Inclement Weather may suspend or shutdown zip line operations. Reopens for 2019 Season on March 15th, 2019! 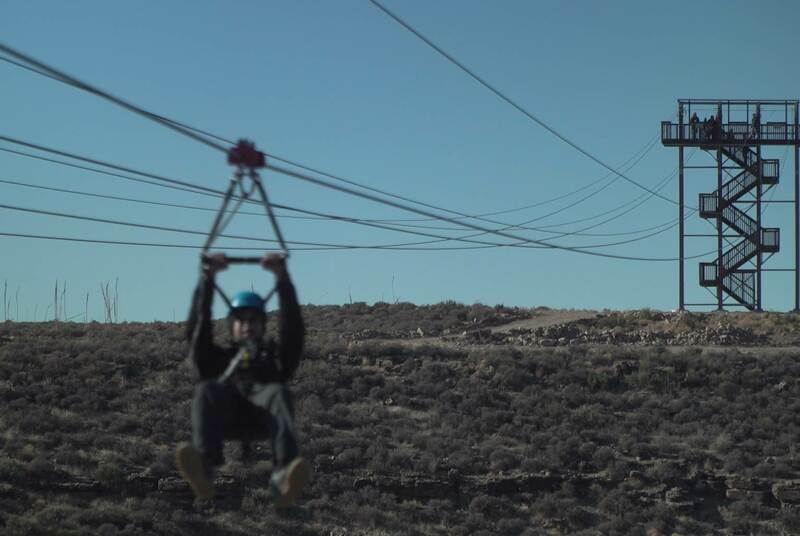 The all new Zip Line at Grand Canyon West consists of two “quad zip lines," each configured with four steel cables running in parallel formation, allowing groups to soar together at speeds approaching 40 miles per hour! The first of the two lines is approximately 1,100 feet in length. The second line, set at a steeper grade, propels guests on the 2,100-foot-long downhill adventure of a lifetime! Complete with views of nearby Quartermaster Canyon, the scenery rushing by above and below will take your breath away. Tickets to the Zip Line at Grand Canyon West include the amenities and hospitality of the Hualapai Ranch. To venture out to our other points of interest, including Skywalk, simply Drive down the road a bit to our Airport Terminal and purchase Hualapai Legacy tickets. You can also purchase your Skywalk tickets while you are there. From the Terminal you will be able to use the included Hop-On/Hop-Off shuttle service to visit all three (3) viewpoints. The Zip Line At Grand Canyon West is one of a kind -- come on out and test your sense of adventure! 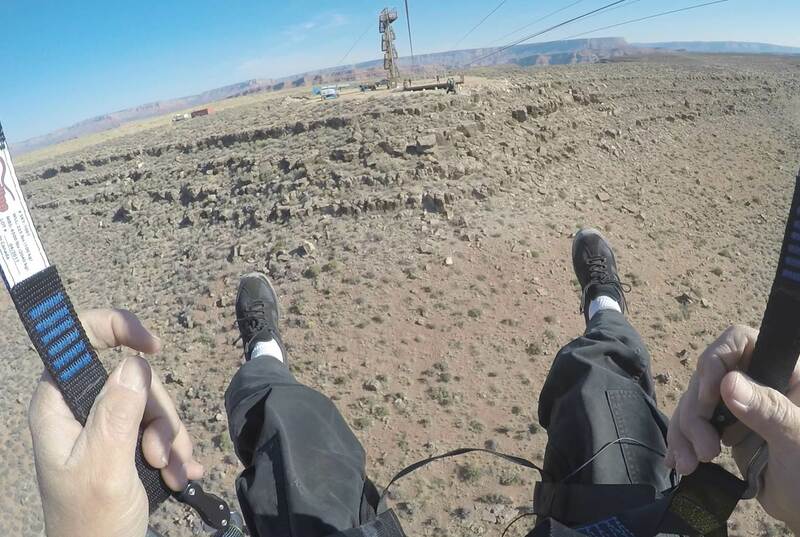 To ride the Zip Line at Grand Canyon West riders must fill out and sign a waiver. Waivers for Minors can only be signed by a Parent or Legal Guardian. Anyone under the age of 18 must be accompanied by a Parent or Legal Guardian. Riders must weigh in between 90 and 275 lbs. The Zip Line at Grand Canyon West has a no cancellation policy. All sales are final and non-refundable. Your ticket is good for the date purchased. In the event that The Zip Line at Grand Canyon West cancels operations due to weather our weather policy will prevail. The Zip Line at Grand Canyon West will suspend operations in inclement weather. In the event of severe weather conditions such as high winds, thunder and lighting, or rain we may suspend zip line operations. In the event of weather related tour cancellations made by The Zip Line at Grand Canyon West guests will be issued a 30 day rain check good for the full value of the reservation. The Zip Line at Grand Canyon West does not make cancellation decisions based on forecast, all decisions regarding weather will be made same day. Please note: Only weather related cancellations made by The Zip Line at Grand Canyon West will make guests eligible to reschedule or receive a rain check. All cancellations made by guests are subject to our general cancellation policy.